The banana and milk diet dates back to 1934, when a doctor at Johns Hopkins University developed it for patients with diabetes. Today it has become more of a fad diet touted for its potential to help you lose weight quickly. You will lose weight, but the banana and milk diet lacks nutrients, and it's so low in calories that you won't get the energy you need. However, you can incorporate aspects of the diet into a balanced meal plan. The original diet consisted of eating four to six bananas and drinking three to four glasses of milk every day for two weeks. This was followed by eating meat, fish, eggs and vegetables, but no fat or carbohydrates, for two weeks. Then the four week cycle was repeated, according to a report in the "Milwaukee Journal." Patients who went on the plan lost 6 to 10 pounds during the first two weeks on bananas and milk. Today the diet plan has been shortened to eating only bananas and milk. Some guidelines suggest staying on the diet for no more than three days, while others leave the time frame open ended. One large banana has 121 calories and 1 cup of skim milk supplies 83 calories. If you ate four bananas and 3 cups of milk, you would consume a total of 733 calories daily. With six bananas and 4 cups of milk, your calories would go up to 1,058. While you will lose weight, you may also put your health at risk by consuming so few calories. Getting 1,200 to 1,400 calories daily is the bare minimum needed to keep your heart and other organs functioning, reports Columbia Health. A diet providing 800 calories per day or less is a very low calorie diet, which should be supervised by a physician. Bananas and milk are nutrient-rich foods, but if your diet included only these two items for an extended period of time you would become deficient in vital nutrients such as calcium, iron, vitamin C, folate, vitamin E and vitamin K. The minimum amount of carbs you need to consume daily to ensure your brain has enough energy is 130 grams, according to the Institute of Medicine. Four bananas and 3 cups of skim milk supply 160 grams, which will not give you the fuel you need for physical activities. You'll also fall short on essential protein and fiber. You can tweak this diet into a healthier weight loss plan. If you include a whole-grain with your banana and milk, such as a ready-to-eat oat or whole wheat cereal, you'll boost carbs, fiber and nutrients while keeping calories low. 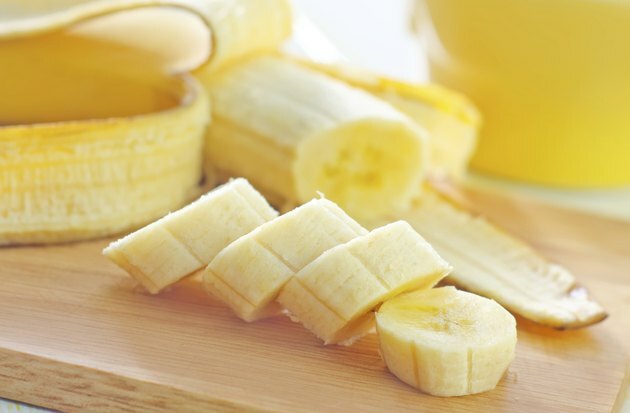 Use one of your banana-milk combinations as a nutritious snack instead of a whole meal. Replace sugary beverages with a cup of milk. Turn your banana and milk into a smoothie, adding berries to get some of your daily fruit. A balanced diet includes all the food groups, so fill out the menu with a variety of vegetables, and boost your protein with lean choices such as beans, fish and chicken.